This home-made granola is delicious and gluten-free. This home-made granola is delicious and gluten-free. Many people are unknowingly gluten-intolerant or sensitive. Gluten is the protein found in wheat, rye, spelt and barley. Common symptoms of gluten intolerance are brain fog, migraines, hormonal imbalance, fatigue, depression, digestive issues. When you are gluten-intolerant or sensitive, it can be hard to find out what foods are right for you. Breakfast especially can be hard to work around as most store-bought cereals and breads contain gluten and high amounts of sugar. 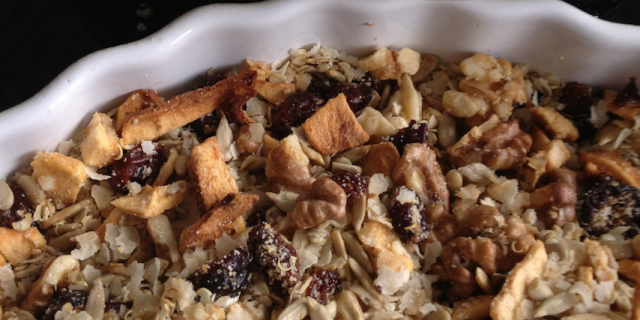 Making your own granola can be a great and healthy option for you. You can mix up this recipe by adding coconut flakes, your choice of nuts, seeds or dried fruits. In a large saucepan on low heat up add agave syrup & oil and gently heat up. When warm, mix all ingredients in and stir well, until all ingredients are lightly coated. Take off heat and place mixture in a baking tray. When ready, allow to cool. When cooled down, store in a air-tight glass container. To serve, pour milk (hemp, almond, rice, oat) over it.